So many times I get irritated at the debates between friends who are of different theological understandings. You know, the Arminean/Calvinist or Reformed/Wesleyan debates over the doctrine of eternal security (or perseverance of the saints). Why do I get irritated? Because so many people on both sides of the debate miss the whole point of grace. (Of course, most have never read the actual works of John Calvin or Joseph Arminius but that is another subject). On one side, you have those who say that once saved, no matter what one does or how they live, they are still assured of eternal salvation. On the other, you have the belief that one can remove themselves from God’s protection by their sinful actions. What many people of both camps miss, however, is the change that occurs at salvation. The old has passed away, the new has come. We have been born again, born anew, born from above. What does this mean, practically? No longer does sin have dominion over us. We can still sin, and we do. We no longer have a life characterized by sin, though. We are no longer under its power nor is it our desire to sin any longer. A person who continues in the same habits of sin with no remorse nor power to stop the sinning has never been transformed into a new creature. He or she has never experienced the new birth, no matter what prayer or ritual they have supposedly made. A life that has been born anew is as different from the old one as a piglet and a puppy are. Oh, both may wallow around in the mud for a little while, but they are fundamentally different and while there may be some similarities they are identifiably different. Those who believe that the doctrine of eternal security gives a person license to sin miss the whole reality of the transformation the Holy Spirit does in a life. No person born from above has a desire to live a life characterized by actions that would bring shame to their Lord. One cannot, of course, ever become un-born. The metamorphosis is one-way. You are either changed or you are not. The confusion comes from those who claim to be Christian, know the words to say, but whose lives do not match their profession. By their fruit you shall know them. There is a reason why Paul tells the church to examine themselves by the light of Scripture to see if they are really in the faith or not. I know this doctrine ties in with election, God’s sovereignty and others equally debated. My point isn’t to stir that pot – yet. My point is that God’s transforming power is so awesome, so complete, that it fundamentally changes the nature and character of the one changed and that change is observable and non-revocable. Once saved you are forever changed. If you are not changed, you are not saved. Period. Go back and study the ones given new life by the Spirit – Zacchaeus, Saul of Tarsus, Mary Magadelene and others. That change is what everyone born of God experiences. If you haven’t, contact me and I will be glad to show you how the Spirit can transform your life forever. It bothers me to hear from fellow pastors that they are not doing counseling, at least, no more than a session or two. It seems that they have bought into the philosophy that they are somehow not qualified to help people with their problems like a “professional” counselor is. This is dangerous thinking. A pastor usually has 4, sometimes 8 – 10 years of formal education in the word of God. Their very calling as a shepherd requires them to use Scripture to help people live productive lives that will be blessed by God. Is this not counseling? How can one justify sending a hurting, confused person that you are spiritually responsible for, from your flock, to an outside person? It is an abrogation of one’s responsibility. Unless there is a medical problem that is suspected, there should not be a referral to an outside person, especially if the one being referred to isn’t even a Christian! Every problem has a sin component to it. It is the pastors job to help identify the problem. Without identifying the sin(s) contributing or causing a persons problem, remedy cannot be made. The pastor needs to lead them to confess and repent of said sin and make restitution where possible. The person must then be given godly habits to instill and accountability with their lifestyle so that there is not a relapse. This holds true for marriage counseling, family counseling, addictive behaviors, etc. It is time for pastors to stop being lazy, stop buying into the lie that they are not capable of counseling, and get involved in the lives of their people. It is easy to preach, easy to lead meetings – it is hard work to actually shepherd a people and care for them. To say you don’t know how means you are admitting you don’t know how to take God’s Word and apply it to real life. You need to repent of your laziness and have the integrity to stop calling yourself a pastor or repent of your ignorance of how to use God’s Word and go and learn. Do you care enough about your people to help them? Do you know enough to help them? Its time to stop playing church, stop playing leader and learn how to serve as God calls us to serve. 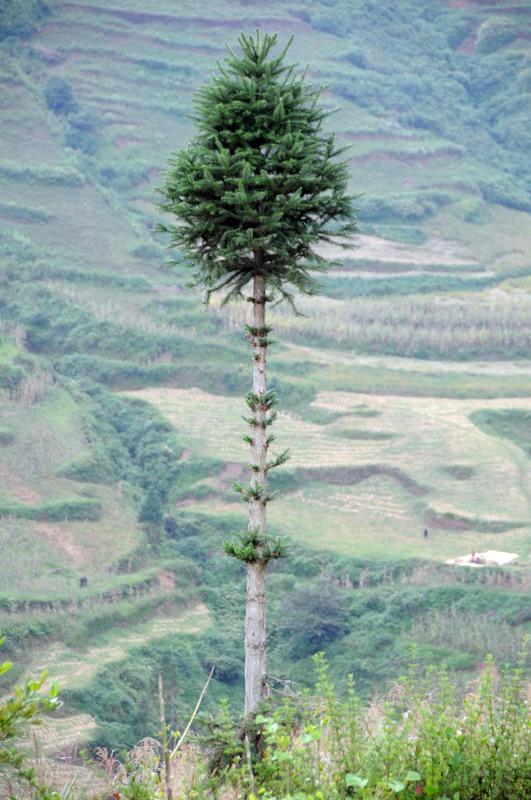 A lone tree standing in the midst of terraced fields in SE China. There are many great hymns about the second coming of Christ. The words of this one, by Charles Wesley and Martin Madan, keep coming back to my mind. The story it tells, contrasting the joyful anticipation of those who believe with the agonizing wailing of those who reject Christ, is very compelling. We forget, sometimes, that while we eagerly await the return of our Lord, that His coming seals the doom of those who are not Christians. He comes with us, His saints, to rule the world with a rod of iron. We long to see our King of Glory enthroned, remaking this earth into a paradise. I believe that we have forgotten that for many of those we know, our friends, family members, neighbors, Jesus is not their King, nor their Savior. They will not inherit His Kingdom, only His wrath. In one sense, I do want Him to come quickly. I am ready, My immediate family is ready. In another sense, there are those I love who are not. I want a little more time, another opportunity to share with them, before He returns. Lord, I am eager for Your return. I long to see You. I desire to see the glories of heaven. I also have people that I love who are not ready for Your return. They do not know You. Please, Lord, let me have another opportunity to witness to them of You. This song has brought comfort to me many times. Whenever I go through trials, whenever I have been faced with persecution because of my faith in Christ, I lean on God to be both my unassailable place of refuge and my defender. Whenever, like the apostle Paul, I am so hard pressed that I despair even of life, my hope rests in the never failing strength and mercy of my God. It is so easy to look at the evil in the world and despair. Often, it seems as if goodness is failing and the darkness is winning. It is then that God’s Word provides the ultimate comfort by revealing the final result – God wins. Good triumphs. Evil is banished. Our ancient enemy is forever defeated by the might of our Savior and God. As a mere human, I am no match for the Prince of Darkness. As a son of the Living God, a prince of the Kingdom of Light, co-heir with Jesus Christ and temple of the Holy Spirit, I have nothing to fear. My life is hidden in Christ and all I have to do is call on His name. He is my refuge and my strength, an ever present help in times of danger. Lord, help me to remember that You are my place of safety, my refuge, my fortress. Help me not to become overwhelmed at the amount of evil in the world but to overcome it by shining Your light. Let me rest in the assurance that You will return, set up Your kingdom, and banish sin and evil forever. Lord, let me also run to You and You alone for safety.